PDF files are a convenient and easy way to save documents for viewing almost anywhere. If you can print a document, you can create a PDF of it. 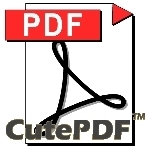 Cute PDF Writer offers free, fast and easy PDF conversion.